Beautiful alter! Thank you for sharing and thanking for creating a space for others to share their tributes! yes, a very traditional picture of our celebration del Día de los muertos! very nice post! Loved your video and the song! What a lovely way to celebrate your Abuelita and other family that have passed. Thank you Maura, for helping me understand this special day of celebration. Beautiful altar and loving tribute. lovely altar Maura, thank you for sharing this special Celebration with us. Just beautiful! I appreciate the lesson in the altar and have a great respect for Dias de Los Muertos. Hi Maura! How long did it take you to make that beautiful altar? all so colorful. i’m sorry for your hubz lost earlier in the year. i remember when you shared that with us. I loooooove your altar Maura, makes me wanna celebrate Dia de los Muertos too! It really is such a cool celebration, makes all the sense in the world, to celebrate the dead! You know what? My parents are Dominican, so I never grew up celebrating El Dia de Los Muertos. However, my grandmother did have altares for loved ones that had passed away. Looking at those black and white photos on your altar brought back SO many memories….Wow! 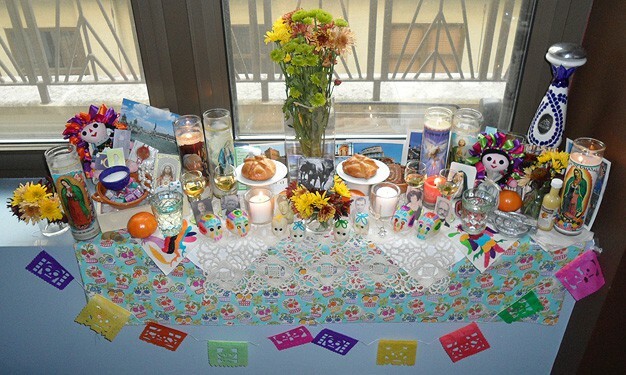 Thank you for sharing your ofrenda with us.